Broadway/Disney royalty was in town last week at the Pantages Theatre. Which members of the royalty, you ask? Well, Cinderella, Jasmine, and Belle…to start. There was no need to splurge on spectacular scenery or lush costumes to bring the spirit of these characters to life. These princesses only needed an intimate stage, their powerful voices, and enchanting music to create the magical Broadway Princess Party (BPP) for princesses both young and not so young. The Broadway Princess Party was originally conceived by Music Director Benjamin Rauhala. Rauhala teamed up with Minnesota’s own Laura Osnes (now a Broadway Tony Award-nominated star) as producer, and the two recruited Disney princesses to bring BPP to the stage. Rauhala opens the show by both sharing its origins and providing musical accompaniment for the performers. Osnes is the first to sing and the host, and provides an incredible musical melody of the uncommonly good songs from Rogers and Hammerstein’s musical Cinderella. She is joined on stage by Susan Egan, who originated the role of Belle in Disney’s Broadway version of Beauty and the Beast and who also played the voice of Megara in Disney’s 1997 animated film Hercules. Courtney Reed, who originated the role of Jasmine in Disney’s Aladdin on Broadway rounds out the trio of princesses on stage. The quality of each princess’s singing was astounding. Just as I might conclude that one was the best, the other two would perform songs rivaling that performance and throwing my judgment into question. 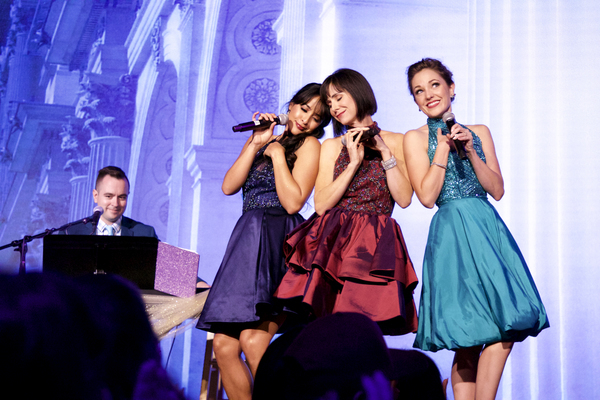 The three princesses went on and off the stage, sometimes singing solos, duets, and trios. Joining them on stage for both a solo and a couple of duets was Adam Jacobs, who originated the Broadway role of Aladdin in Disney’s Aladdin and who performed at the Orpheum Theatre last year as part of the Aladdin touring company. His duet with Osnes in “Do I Love You Because You’re Beautiful” was the highlight of his performance.